Indulging in Jacuzzi hydrotherapy is the perfect way to unwind after a long, strenuous day. If you ever had a chance to relax in a Jacuzzi tub, you must know what it can do to help your mind and body. Studies show that a soak in a Jacuzzi can improve your overall well being and leave you feeling invigorated. That said, having a high-pressure hydro massage with warm water that is directed to specific body parts can help relieve aches and body pain. Likewise, physiotherapists often include hydrotherapy in the rehabilitation program for patients suffering from sports injuries, muscle & joint soreness, arthritis, and tendinitis, among others. VERDURE offers ready to install Jacuzzi / Whirlpool on Indian made acrylic tub of different sizes & shapes (like round, rectangular, square, corner & designer models ) equipped with imported Jacuzzi kit comprising of imported Jacuzzi pumps of different ratings, Water jets, Air pneumatic control & necessary fittings suitable for both domestic and commercial applications. 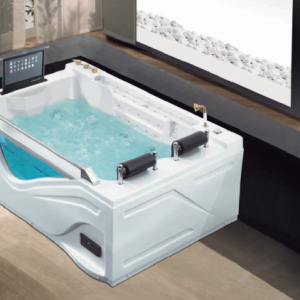 These Jacuzzis can also be equipped with other optional features like Filtration system, On-line heating system, Bubble bath system, Back massage system, Control panel, Under-water colour changing lights, Faucet set with hand shower, FM music, etc, to make them more beneficial & enjoyable. 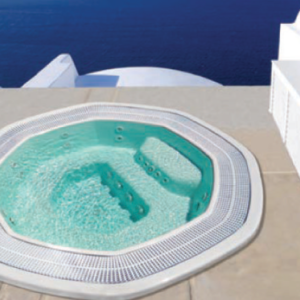 Our Jacuzzis can easily be installed in homes, hotels & resorts due to their easy portability. We also customize as per your specific requirement and can install the Jacuzzi system on your concrete tub/pool as well. Before proceeding with the Jacuzzi tub installation, make sure that you have the necessary electrical and plumbing in place, and the foundation can hold the extra weight. On average, a Jacuzzi tub weighs 700 Lbs, and once you add water and your body weight into the equation, the entire setup can weigh up to 1,000 Lbs. Therefore, it is always better to contact a reputable contractor and take their help to assess the situation. In general, there are two choices when installing a jetted or whirlpool bathtub. The first is for tubs, which have flanges (these are meant to be attached to the wall studs). Such tubs have a base large enough to rest upon, and a frame for the face of the tub, requiring you to install tiles or similar material here. The second type is a top-setting tub that rests over a platform, which in turn, sits upon a customized tub frame. While the size of the frame is up to you, the size of vertical studs must be 16-inches on center and from each other around the frame. In addition, a 3/4-inch plywood must be used on top and cut according to the hole required by the Jacuzzi tub. One of the most important Jacuzzi tub accessories is the motor that helps run the jets. Therefore, you need to provide an electrical outlet inside the tub framing. Alternatively, you can mount this by the motor itself, and as high up on the tub frame as possible, without getting in the way of the motor. This will help keep water away from the motor, in case of accidental leaks. In addition, you also need to include a ground fault circuit interrupter (GFCI) outlet (models which have independent heating sources, usually require two GFCIs.) and wire them into your home’s electrical circuitry. 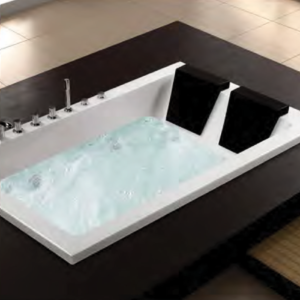 Covering the tub’s frame with a finish material is an important aspect of jacuzzi tub installation. Usually, tiles are preferred here (either ceramic or natural stone.) in addition, you can consider installing the tub either before or after the tile attachment. In terms of structure, there is more support if the tub installation after that of the tile, because you will then have a layer of thin-set mortar between the ¼-inch-thick concrete board and the wood, on top of the ¾-inch plywood. Likewise, more mortar is applied while installing the tile, which adds another ¼ to ⅜-inch on average. While the Jacuzzi tub frame itself is level, they are generally installed over a bed of fresh mortar, thus adding an additional support to the bottom. While some manufacturers specify mortar, there are others who prefer foam pads. Likewise, you can also spray expanding foam under the tub. Both mortar beds and expanding foam require a layer of sheet plastic between themselves and the bottom of the tub (to assist in removal of the tub.) Moreover, the tub must be completely filled with water for a minimum of 72 hours, while the mortar or foam dries. This helps contour the support material with the weight of water acting as a human body. Getting a Jacuzzi tub installation done allows homeowners to enjoy all the benefits of an outdoor hot tub indoors. You don’t have to worry about privacy any longer. 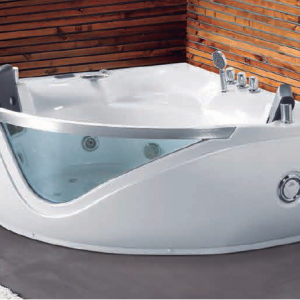 Likewise, Jacuzzi tubs are the perfect luxury item that will help you increase the overall value of your home. 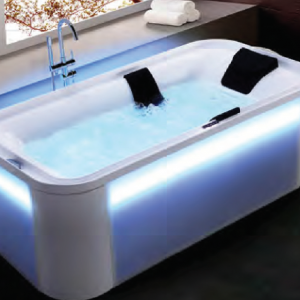 Lastly, Jacuzzi tubs are the perfect accessory to relax sore muscles and relieve joint pain. 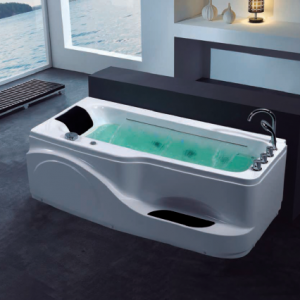 Leading the way for hassle-free Jacuzzi tub installation in Delhi, VERDURE offers a wide range of ready-to-install Jacuzzi tub and Whirlpool bath tub. These products feature different sizes & shapes (for example – round, rectangular, square, corner & designer models) and are extensively made from acrylic. 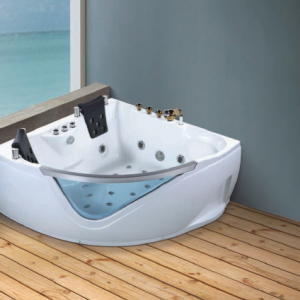 Furthermore, each Jacuzzi tub comes equipped with imported Jacuzzi tub accessories, which include pumps of different ratings, Water jets, Air pneumatic control, and other necessary fittings for both domestic and commercial applications. 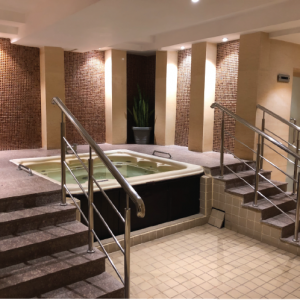 You can also customize your Jacuzzi tub with optional equipment such as Filtration system, On-line heating system, Bubble bath system, Back massage system, Control panel, Under-water color changing lights, Faucet set with hand shower, and FM music. 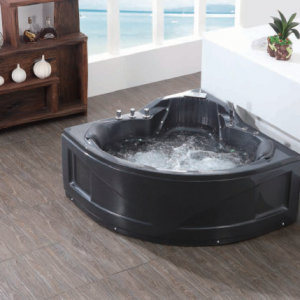 In addition, VERDURE helps with easy Jacuzzi tub installation across a number of settings including homes, hotels & resorts, and even concrete tubs/pools. 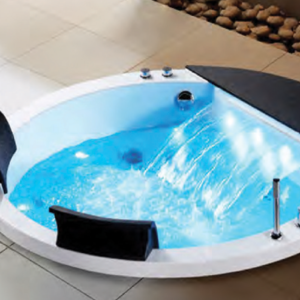 What are you waiting for – visit our store or buy Jacuzzi online today? The Antigua spa, with a diameter of 2.78 metres, has a groundbreaking octagonal design that adds that extra touch of luxury and distinction, which is so prized in hotels, residential complexes, beauty centres, spas, etc. The seven-seater Antigua spa has a full massage circuit. Perfect for the enjoyment of couples or even a get together with friends. Equipped with twenty seven jets and twelve air nozzles.